In this article we explain all you need to know about the Betfair Exchange including the latest welcome offer, back bets, lay bets, trading, In-Play betting, Betfair’s commission structure, market liquidity as well as looking at Betfair’s Exchange app offering and more. What Is A Back Bet On The Betfair Exchange? What Is A Lay Bet On The Betfair Exchange? Betfair are an online gambling company that provide an online sportsbook (fixed odds), online casino, poker and bingo products. What many people don’t know however, is that Betfair is also home to the world’s largest online betting exchange. The Betfair Exchange allows for customers to bet against one another rather than a bookmaker. This means customers can offer odds to, or request odds from, fellow Betfair gamblers and ‘back’ or ‘lay’ the outcome of a specific market. The traditional type of betting entails between a customer and a bookmaker where the customer ‘backs’ a bet and the bookmakers ‘lays’ it. Exchanges effectively cut out the bookmaker and allow the opportunity for a punter to do both, giving customers more control and a better prospect of making money. All new Betfair Exchange customers can claim up-to £1,000 cash back. Simply open an account using promotion code ‘EXCACR‘ and you will have 30 days from the date of registration to accrue Betfair Points and reach one or more of the specified tiers to receive cashback. Firstly, click here to head to the Betfair Exchange landing page. Create an account using code ‘EXCACR‘. Start betting to earn Betfair Points. You will then earn cashback up-to £1000 based on the number of Betfair Points you earn (see table below) in your first 30 days. Just like when wagering on a traditional sportsbook, a ‘Back’ bet is where you stake money on something you think will happen and will therefore make profit if it does. The benefit of using the Betfair exchange is that you can ask for a better price (bigger odds in the case of backing). To place a Back bet, simply select the market you want to back, enter your odds (into the box on the left) and stake (into the box on the right) and click ‘Place bet’. You will then be placed in a queue until someone agrees to take your bet on. A ‘Lay’ bet is where you play the role of a traditional bookmaker by offering odds for something not to happen. If indeed the specified event does not occur, then you win the person’s stake. For example, there may be a team that you strongly expect NOT to win the World Cup, but you’re not quite sure who will. Well, by ‘laying’ that team, you are effectively backing every other team to win. To place a Lay bet, simply select the market, enter your odds (into the box on the left) and stake (into the box on the right) and click ‘Place bet’. Remember, when laying a bet, you want the odds to be lower in order to decrease your liability. Betfair will show what your liability is when you have laid the selection which is calculated by multiplying the odds you offered by the customer’s stake and then subtracting the stake. The ability to both back and lay in one place means there is an opportunity for trading. Similarly to stock exchanges and financial markets where a trader will look to buy at a low price and sell at a high price, when trading on Betfair, you should look to lay low and back high. Do this and you can lock in a profit before the event is over or sometimes even before it has occurred. Trading on the exchange is similar to the Betfair ‘Cash Out‘ option provided within the site’s sportsbook. The only difference being is that on the exchange, your bet will continue, despite already locking in a profit, whereas cashing out instantly settles the bet. Let’s imagine a horse opens up at 17.0 and you expect it to be a lot shorter come the start of the race. This presents you with a perfect trading opportunity. You back the horse at 17.0 with a stake of £20 and stand to make a profit of £320 (17.0 x £20 – £20 initial stake) if it wins. The day of the race you check the market and, as you expected, there has been continued support for the horse which is now available to lay at 6.0. The horse wins – The back bet brings in a profit of £320 but the lay bet means you have to pay out the liability of £250. This means you’d make a profit of £70 (£320 – £250). The horse loses – The stake on your back bet of £20 is lost but you have gained the £50 backer’s stake meaning a total profit of £30 (£50 – £20). Another way to look at trading would be for a golf tournament, which is slightly different to Example 1 as you will likely be executing the moves In-Play rather than before the event. Backing a golfer at odds of 125.0 pre-tournament can provide a great trading opportunity, if they perform like you expect them to. Let’s imagine the golfer is in contention after round 1 and you decide to sit tight before he moves up the leaderboard in round 2 and is now sitting second. The golfer is now available to lay at 8.0. You can now lay a fair amount while still letting your back bet at such big odds continue because he’s played well so far. The key to trading is finding the edge. This at times can be as simple as taking advantage of a price quick enough before it collapses. Finding overreactions with prices being either too big or too short also provides trading openings while it is also good to monitor market behaviour. In-Play betting allows you to assess an event before parting with your money. You will know if Betfair is offering In-Play odds on a market when you see the green tick under the name of the event. One aspect of Betfair’s In-Play options that stands out is within their horse racing markets. The ability to bet on a race in real-time can provide an opportunity to be hugely profitable. So you may be wondering how Betfair make their money? Well, in exchange for allowing you to use their platform, Betfair take a small % of commission on all winning bets. You do not pay commission on losing bets. Your Net Winnings are what you stand to win on a bet once your stake has been deducted. Market Base Rate is the most commission rate you pay on a market and is determined by the country you are living in. If you reside in the UK, Ireland, Italy, Gibraltar and Malta then the rate is 5%. 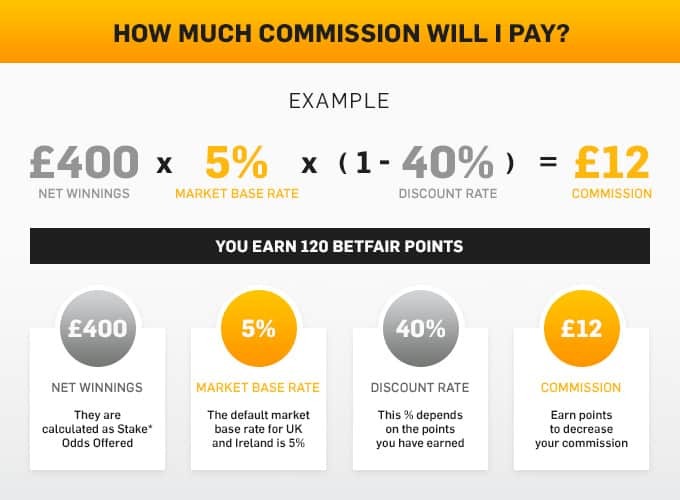 Your Discount Rate reduces the amount of commission you pay and is based on how many Betfair points you have earned. You can earn Betfair points whether you win or lose – the more points you earn, the less commission you pay. £400 x 5% x (1 – 40%) = £12 commission to pay. For every 10 pence of commission you have paid or would have stood to pay if you won, you earn one Betfair point. Over 7000 Betfair points gives you a 10% discount rate. Something that is not usually mentioned when it comes to the Betfair exchange is the liquidity of the market you are getting involved in. Liquidity is the amount of money available for you to bet (Back or Lay) at the corresponding odds on the corresponding selection. The liquidity is displayed on the odds buttons of each selection on which you can bet while you can also see the total amount of liquidity. High liquidity markets provide a higher likelihood of your bets being matched as there is more interest and turnover involved. A market with low liquidity can be easily noticed and therefore avoided until interest increases. Generally speaking, anything less than five figures would suggest there is little liquidity in the market. Gaps in the prices of backing and laying also suggest little money is involved whilst the amounts of money waiting to be matched under the odds will give you an idea of the interest in the market. While it would be wrong to say avoid low liquidity markets entirely, they do come with their disadvantages. When there is little money involved in the market it is hard to make money, especially if you are considering trading, because the lack of interest can force you into taking prices you wouldn’t normally want to. On the other hand, high liquidity markets offer more money and more customers which in turn gives you a better chance of getting better value. Betfair Start Price (BSP) is different to that of the Start Price (SP) that is associated with traditional bookmaking. Betfair Start Price is based on the bets placed by both backers and layers in any markets and unlike with traditional bookmakers, there is no margin for profit built in which is why BSP normally tends to offer better value. As the BSP is not accounting for a profit margin, it can be calculated to guarantee the fairest odds for both backers and layers. While BSP correlates mostly with horse and greyhound racing, it is important to note the starting prices of football games in particular. Prices for teams involved in the most recognised games and leagues (Premier League for example) normally go off on Betfair at the correct value due to the large amounts of money involved from professional syndicates and punters. The Betfair Exchange app provides a fast, secure and easy-to-navigate betting experience. Login to your account and have access to back and lay betting markets and view live sports scores which automatically update alongside live price refreshes, ensuring you always have the best odds and market information available. Auto Cash Out – Set your target and enjoy the race. Racing Pages – Archive video and improved navigation. The Betfair Exchange app has a sufficient number of reviews on both the Google Play Store and on the Apple App Store for us to get an honest feel of what regular users of the Exchange app think. At the current time of writing, the Betfair Exchange app has attained a hugely disappointing average rating of 2.5 stars on the Google Play Store, however, things are much, much more positive on the Apple App Store where Betfair’s iPhone Exchange app stands at a current rating of 4.0 stars. When combing through the reviews in more detail, it seems that most Android users who had left negative reviews were experiencing technical issues and crashes, which would go someway to explaining such a poor rating. Meanwhile, despite the iPhone app’s impressive rating, there were still some references by users to the app being bugger. The Betfair Exchange is a great alternative to the traditional sportsbook as it generally provides customers with better odds, better transparency, but arguably most importantly, a fairer gambling experience. The fact that the majority of professional punters use Betfair as their platform to trade speaks for itself. That doesn’t necessarily mean that it is for everyone, but rather that it is reliable. You can also bet with the assurance that you will almost certainly not have your account restricted, which the same can’t be said with traditional online bookmakers. The potentially slight downfall to using the Betfair Exchange is the lack of liquidity in certain markets, although even then, you’ll likely still have chance to get some money down.